Phan Duy has a distinguished background in both the media and financial industries. 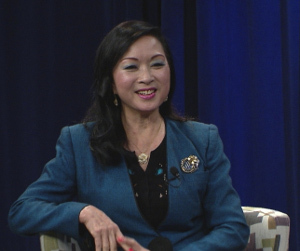 As a broadcaster, Ms. Duy has served as general manager with Vietnamese American Network Television, producer with V-Star Television, program director with Vietnam Vision of American Network Television, a program host with Saigon Radio 900 AM, and currently show host at Saigon Network Television 51.3. Concurrently, she is a Financial Advisor with Transamerica Financial Advisors, Inc./World Financial Group, whose focus on building a New Industry by providing the financial literacy to the public. Ms. Duy is active in community service as well, as a member of Đoàn Văn Nghệ và Công Tác Xã Hội Lạc Việt, the Vietnamese Culture and Science Association, Lunar New Year Houston, and the US Census Leadership Group. Additionally, she was a Vietnamese culture teaching artist for HISD 4th graders under a grant from Houston Grand Opera and the associate producer of the world premiere musical The Tale of Kieu. Ms. Duy holds a bachelor’s degree in education.